If you’re read anything we’ve written on the subject of Betterment, you know that we generally have glowing things to say about this service. You can read our complete thoughts in our long form Betterment review. Betterment has convinced more people to start investing in the past couple of years than almost any other source. It’s all about convenience and value. With the ease of signing up for a Facebook account, a new investor can fund his or her first investments, with minimal knowhow required. The thing is, some investors feel restricted by the very value proposition that Betterment boasts. We’ll take a look at a few considerations below. Betterment Does All the Work For You. Depending on your personal disposition, this could be a pro or a con. When you sign up with Betterment, the platform automatically sets up a portfolio on your behalf, based on stock and bond ETFs purchased through Vanguard’s marketplace. We’ll get into the cost and education details a little later, but for now you’ve got to accept the possibility that by giving up control of your portfolio to a robo-advisor, you can’t be sure that the company will act in your best personal interests. Following Brexit, for example, Betterment briefly halted all trading. This drew a lot of ire from its user base and the investment market in general, as a sudden stock market drop is as much an opportunity as it is a danger. There are many other examples that could be provided, but suffice to say, a one-size-fits-all portfolio composition is not necessarily the best thing for all investors. It’s easy. It’s convenient. And it’s a very solid portfolio balance of low-cost funds. But because no Betterment investor has the controls to monkey with the internal workings of their personal portfolio, some people see this as a dealbreaker for the burgeoning investment platform. Betterment Costs a Little More Than the Cheapest Alternatives. Another common complaint about Betterment is its cost, though you’ll see just as many people say the pricing is a good thing. Compared to Vanguard, the company from which Betterment buys the ETFs it puts in its user portfolios, Betterment is pricey. Compared to just about everybody else, they’re really cheap. Betterment justifies this extra cost because of the point above (they do all the work for you). On top of that, users get a cool website that’s actually very informative, and free money saving services like tax loss harvesting. However, all of this could be had at the big V for about a third of the price. Of course, with Vanguard there’s no safety net, and no one to guide you along the way unless you’re willing to dig through user forums. At the end of the day, Betterment’s 0.15% – 0.35% is still much lower than any flesh and blood advisor, and only a couple tenths of a point higher in cost than the cheapest portfolio that could conceivably be constructed anywhere. But because these are retirement accounts, after all, savings can add up to tens or hundreds of thousands of dollars over decades. The cost is worth mentioning. Betterment Might Stunt Your Investment Knowledge. This is one of the other half Pro, half Con aspects of Betterment. Because they make every aspect of investment so easy, even automating re-allocations, tax harvesting measures, and Tax-coordinated asset movement (putting expensive holdings in tax-protected accounts, cheap holdings in taxable accounts), some complain that these essential skills are never learned by the account holder. These people have a point. Knowledge is power, and this is never more true than investing. The more you know about moving your own money around, the more likely you will be to spot an opportunity or catch a mistake. Betterment is essentially idiot proof, but if you are an idiot when you start your account you might never improve your situation. On the other hand, Betterment doesn’t have to be your only investment account. It’s a solid platform for retirement investing, and other goal oriented investments. Its ease of use enables new investors to get their foot in the door, starting an important process they might never initiate if it weren’t made so easy. Our advice? Learn everything you can about investment, even while you use Betterment. You’re likely to find, like so many others, that Betterment has a part to play in investment business you do with a variety of investment companies and platforms. Betterment’s Investment Theory Might Not Prove to Be the Most Effective. Betterment is about diversification with as little buying and selling as possible. That’s why they use Vanguard ETFs. An ETF, or exchange traded fund, is just like a mutual fund, with an important variation. ETFs trade just like stocks. You can by as much as you want in a single step, and the cost of the transaction is a lot lower than traditional mutual funds. A great ETF provides massive diversification, without the maintenance needs that drive up the costs of mutual funds. Betterment chooses a handful ETFs from Vanguard and composes all of their user portfolios from them. Of these, there are ETFs built around emerging markets, small and large cap stocks, and other US-based ETFs. The thing is, some people complain that their choices aren’t the most sensible. Without getting into the details, there are contrary theories that question the sensibility of including “Emerging Markets” in the Betterment portfolio, claiming that this is just a show of diversification without producing meaningful results for users. On the other hand, Betterment’s returns have been massive (over 100%) since the company’s founding in 2004, so maybe they are onto something. It’s up to you to decide for yourself. If You’re Not Careful, Betterment Users Can Create Tax Problems For Themselves. 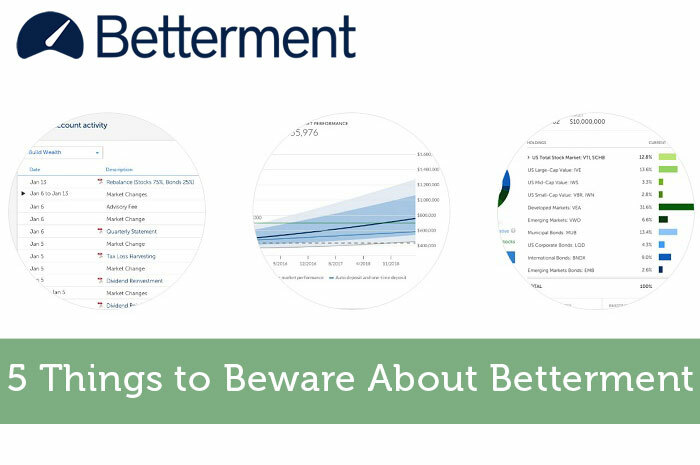 Betterment is known as the “set it and forget it” robo-advisor platform. And they achieve that very well. But there are still responsibilities that Betterment users need to carry – specifically the paying of taxes. Betterment is really good at getting you the tax documentation you need on time, but they can’t pay your taxes for you. If you sign up for a Betterment account and think that you never need to think about it again, this could bite you down the road. There is also the more specific issue of tax loss harvesting. This is an automatic service in which Betterment’s algorithms automatically sell losing options in order to “lock in” losses and drive down capital gains taxes down the road. It’s actually a great little service that could, in some cases, cover the cost of your entire Betterment account and put some money in your pocket besides. On the other hand, if you’re not careful you could run into some trouble with Wash Sales, if your spouse has a similar retirement account elsewhere. If that’s relevant to you, do your own research. In the end, Betterment’s value propositions are real, but each feature can be seen as a liability to certain people. If you are considering Betterment, think about both sides of the story. Do you want convenience or an educational learning curve? Do you want the cheapest option on the market, or do you want an easier experience for a little more money. Do you believe Betterment when they say their theory of portfolio construction is the best for their users? The way you answer these questions will determine whether or not the service is for you.